Here good news for Idea mobile operator. Now idea users can share their balance to someone. How cool it was. 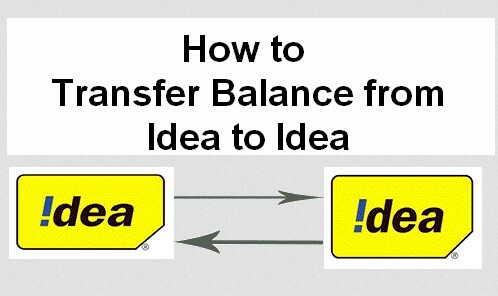 If know the idea mobile balance transfer tricks then you can transfer idea balance to someone. In case you do not have any idea about balance transferring just looks at here. I will try to explain how to transfer mobile balance from idea number to other idea number. This service is more helpful when we do not have enough balance to call someone. But idea operator will take some service charge to their customers. The service cost will be just two rupees. If you want to transfer your balance to someone then follow step by step here then you come to know how to transfer mobile balance from idea to idea number. It’s only possible when both transmitter and receiver using same mobile operator. Otherwise you cannot transfer your balance to other. There are few instructions that you must be known while doing this process. The first thing is you have to know about idea USSD code for transferring balance or idea to idea mobile balance transfer code. Next thing is you can only share local idea numbers and the balance amount will be like 5, 10, 20, 50, 100, 150 etc. You can share your balance five times per a day and not more than that. Here I am explaining how to transfer mobile balance from idea number to other idea number. Let’s start the process. Just simple open the keypad and enter the idea mobile balance transfer number. The Idea balance transfer USSD code : *151*local idea number of your friend’s number* enter the amount how much you want to transfer. I hope you have share your Idea balance successfully. Just once check the number and do not enter the incorrect number because idea is not responsible for lost of balance in case of entering wrong number. Now transfer idea talk time or transfer mobile balance idea to idea. You can only share same mobile operators. I do not think you may get any problem while transferring idea mobile balance. Thank you it worked very well.